Frank Pickering (see also his profile on Lives of the First World War) was born at Littleworth, Wing, near Leighton Buzzard, Buckinghamshire, in the latter part of 1894, the only child of Merrishaw (or Merryshaw) Pickering and Frances (nee Stockton). His parents had married at St Barnabas, Sutton, on 9 September 1893. Exactly how they met is far from clear, they demonstrate that even in the 19th century working class people could be surprisingly mobile. Merrishaw was originally from Barnack, Northamptonshire (near Peterborough). In 1881 he was working as a groom nearby on the Burghley Estate, just outside Stamford. Frances had moved the short distance north from her birthplace at Alford, Lincolnshire to Louth and was working as a cook. By 1891, Merrishaw was working at Wheatley Hall, Doncaster, Yorskhire (still a groom). Frances’s brother, John George Stockton, was working as club steward at the Conservative Club in Doncaster, so perhaps it was in Doncaster that Merrishaw and Frances met? Frances herself has so far proved elusive in 1891. Frances had been at her sister, Clara’s, wedding to George William Heather at St Luke’s, Chelsea on 31 August 1890, and she seems to have been living with them at Myrtle Road, Sutton, at the time of her marriage to Merrishaw. George and Clara were living in Myrtle Road at the 1891 Census, and the 1892 rate book for Sutton also puts them in Myrtle Road. Though born in Camden Town, George was resident in Sutton (Home Cottage, Lower Road), with his parents and siblings in 1881. Merrishaw and Clara’s wedding register entry gives his residence as Wing, so he had evidently already moved down from Yorkshire by then. Alex Coles, who runs the Wing One-Place Study tells me that the Pickerings were tenants of the famous Rothschild family, who at this time owned Wing’s “big house”, Ascott, (now a National Trust property). It’s therefore likely that Merrishaw (now recorded as a stableman) was working for them. Merrishaw was 31, Frances 34. Frances has no occupation recorded. Her father was John Stockton (deceased), a stonemason. 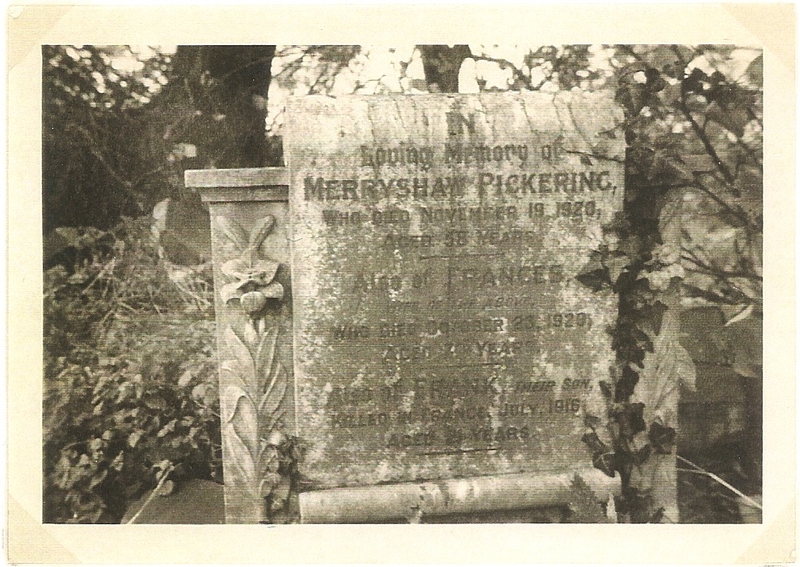 Merrishaw’s father is recorded as John Merrishaw (also deceased), as if Merrishaw was his surname, though the 1871 census records him as John Pickering. Frank’s birth was registered in the 4th quarter of 1894 in the Leighton Buzzard registration district. By 1901 the family were in Littleworth, Wing. Merrishaw(38) is now recorded as a groom (not domestic). Frances was 40, and again no occupation is stated. Frank was 6. At some point between then and 1911 Frank moved to his aunt and uncle in Sutton. He would presumably have been in school until he was 14 or so, which means the earliest he would have moved was perhaps 1908. The 1911 census records him with George William Heather (47) and his wife Clara (48 – Frank’s mother’s sister), and their two daughters (Frank’s cousins), Annie Dorothy (18) and May Letty Gladys (13). George is a lamp inspector for the gas company, Frank is a gas fitter, also for the gas company. Annie was working for the Post Office, May was still at school. They were living at the Old Gasworks Cottage, Wrythe Lane, Carshalton. The 1912 rate book suggests (significantly) that this was next to the inn called “The Cricketer’s” with it’s landlord, Frederick William Bird. The baptismal registers held by Sutton Archives, and now available online via Ancestry, show that Annie was baptised at St Barnabas, Sutton on 16 April 1893. George was then recorded as a plumber. May followed, again at St Barnabas, on 13 June 1897. George was then a gas fitter. On both occasions they were living at 28 Myrtle Road. They were still there in 1901. Frank did not join up immediately on the outbreak of war. His entry in the National Roll of the Great War (a subscription funded book, so the details were presumably entered by his parents) records that he joined up in November 1915, so he possibly joined up under the terms of the Derby Scheme. He seems to have only ever served with the King’s Royal Rifle Corps, with the regimental number C1600. He may have served initially with 19th (Reserve) Battalion, KRRC, which had been formed from the depot companies of the 16th (Service) Battalion (Church Lads’ Brigade) Battalion, KRRC. Frank was presumably posted overseas in the early part of 1916, where he joined 16th KRRC. It is not known whether Frank was ever actually a member of the Church Lads’ Brigade in either Wing or Carshalton. 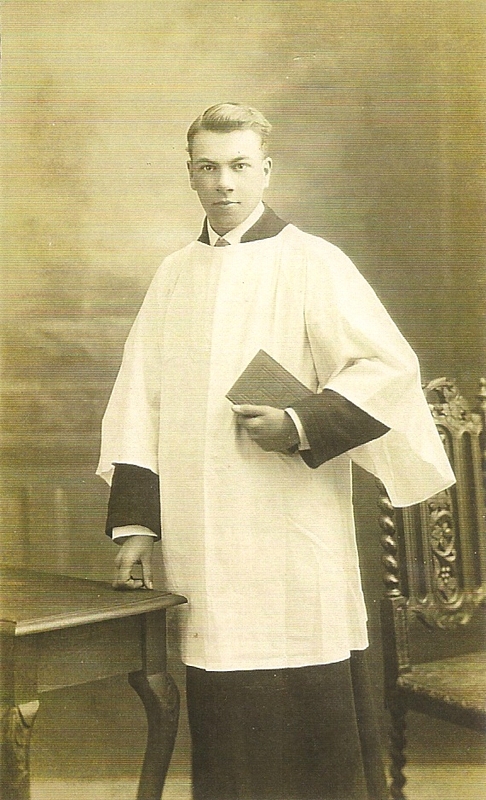 Clearly he was a ringer, and the photo of him in robes suggests he either sang in the choir, or was an altar server, so he was certainly closely connected with the church. 16th KRRC was also known as the Churchmen’s Battalion. Frank fell during the battalion’s attack on High Wood. He was one of over 100 killed from the battalion that day, with many more missing or wounded. Soldier’s Died in the Great War records that he died of wounds, while the Soldiers’ Effects Registers simply say “death presumed” implying he had been recorded missing initially. Whichever, he has no known grave and is commemorated on the Thiepval Memorial. The Church Lads’ and Church Girls’ Brigade has a fact file on the battalion (and High Wood). Andy Arnold also describes the action, mostly from the point of view of 1st Battalion, the Queen’s (Royal West Surrey Regiment), maps in this post show the day’s events well. Frank is also commemorated on the Wing War Memorial, the Carshalton War Memorial and the “Willie Bird Cross”, named after the son of the landlord of The Cricketers, who also died during the war. The cross bears the names of those from the Wrythe who went to the war. Although there’s no record yet been traced of Frank’s ringing before the war, he was named at the National Memorial Service at St Clement Danes on 22 February 1919 as among the fallen. Carshalton also rang a quarter peal in his memory that same day, though curiously, it was reported in the local press, but has not yet been traced in The Ringing World. Many towers rang to commemorate their dead that day in conjunction with the service at St Clement Danes, or the local equivalents held around the country. Frank does not seem to have left a will in the Soldiers’ Wills collection, nor can I find a normal probate record. However, his entry in the Soldiers’ Effects Registers describes his parents as joint legatees. They received an initial payment of £3 17s 9d on 5 September 1917, presumably pay that had never been issued to Frank, and then his war gratuity of £3 on 8 October 1919. £3 was the minimum paid as war gratuity, to those whose enlistment was under a year before their death. This would be worth no more than £2,400 today, and possibly as little as £285, depending on the basis used to calculate the equivalent. 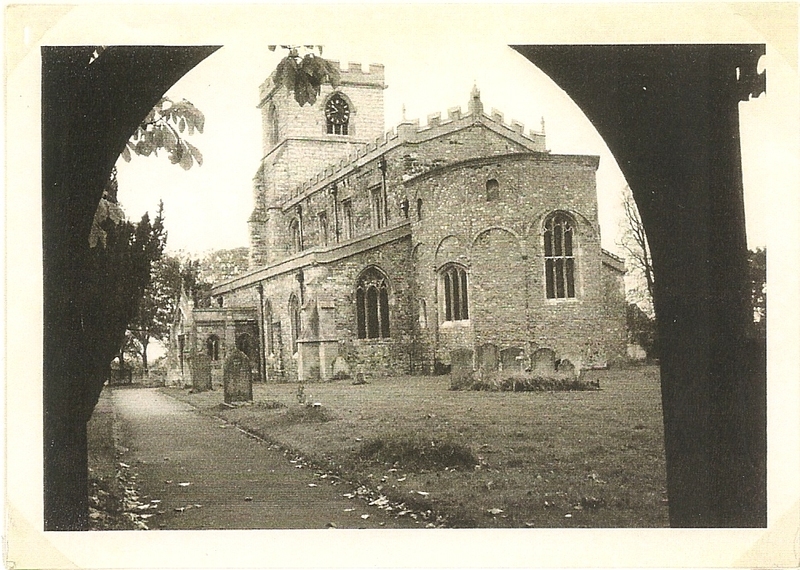 After the war, a cousin of Frank’s, Ralph Pickering, obtained photos of Frank, Wing church, the Wing War Memorial and the Pickering family grave in Wing (which also commemorates Frank, in addition to it being his parents’ resting place). These passed to his son Roger, who gave them to David Humberston. David Contributed these to the database held at the Thiepval Memorial visitor centre. David was contacted by Andy Arnold who has researched the Carshalton war memorials, and Andy passed on the photos to me with permission to use them on this blog. Wing church, photographed from the lych gate. It is similar to a postcard shown on the Wing one place study website, thought to date from the mid-1920s. 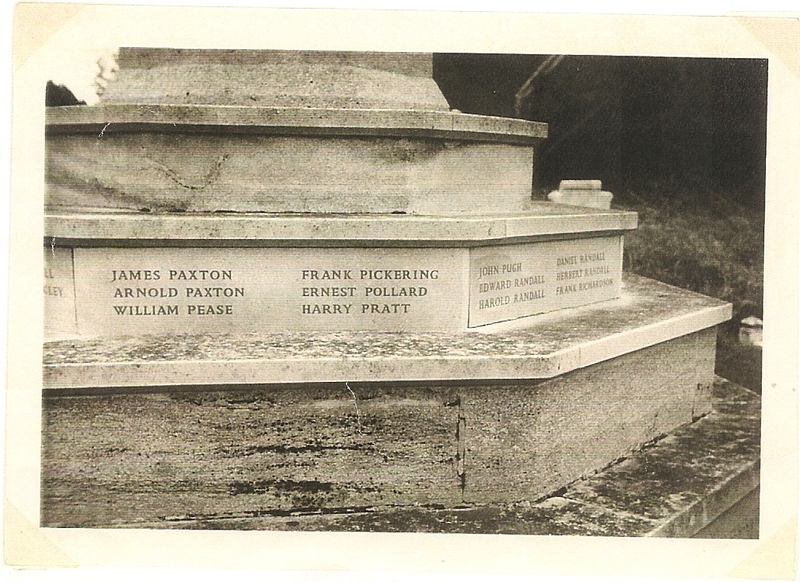 Photo of the base of Wing war memorial, showing the name of Frank Pickering. Further photos of the memorial can be found on the Wing one place study website. This entry was posted in Carshalton, King's Royal Rifle Corps and tagged Carshalton, First World War, Frank Pickering, Lives of the First World War on 15/07/2016 by davidunderdown95. Carshalton is one of the shorter tower pages that will appear, with just two men. However the fact that one of those two, Rifleman Frank Pickering, died gives it one of the highest death rates of all the towers. The Carshalton War Memorial has already been well researched by Andy Arnold – I recomend visiting his website about the memorial (previously referred to on the Benhilton tower page). The other man Henry Stanley is one of those whose identification is still rather tentative. Listed only as H Stanley on the original roll, Henry seems the best candidate in the censuses, but there is no other verification of his military service. This entry was posted in Carshalton and tagged Bellringing, Carshalton, First World War, Frank Pickering, Henry Stanley on 30/11/2012 by davidunderdown95.